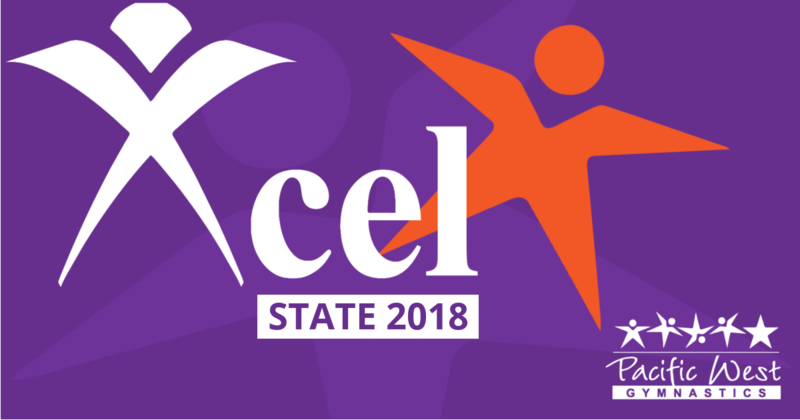 Pacific West Xcel Silver, Gold and Platinum Teams competed in their State Championships last weekend March 9-11, In the Silver sessions Jillian Noblejas placed 2nd on Bars and Beam in the Child G division. Joceleyn Rohde and Ananaya Mukundan tied for 2nd on Beam in the Senior F division. In the Xcel Gold sessions, Mia Gonzalez was the All Around, Bars, Beam and Floor State Champion in the Junior B division. Alyssa Valera was the State Champion on Bars, placed 2nd on Vault and Beam and placed 3rd All Around in the Senior A division. Bahar Ayar placed 2nd on Vault in the Senior E division. In the Xcel Platinum sessions, Leilani Segarra was the All Around, Vault, Beam and Floor State Champion in the Junior B division and will also compete on the Northern California State Team at the Region 1 Championship. Maggy Narravula placed 3rd on Vault in the Senior C division. Congratulations to all our girls on qualifying to the Xcel Regional Championships coming up in April! Pacific West Xcel Bronze team competed in their State Championships last weekend March 24th – 25th. Elaina Root placed 3rd on floor in the Child F division. Aarish Grover placed 3rd on bars and 3rd on beam in the Junior G division. Stacy Nguyen placed 2nd on bars in the Junior G division. Brook Joly was the state champion on bars and beam in the Junior D division. Melody Barrios placed 2nd on vault in the Junior E division. Santia Ali placed 2nd on bars and 3rd all around in the Junior H division. Michelle Chen was the state champion on floor, placed 2nd all around and 3rd on bars in the Senior I division. Congratulations to all our girls on a wonderful first season!